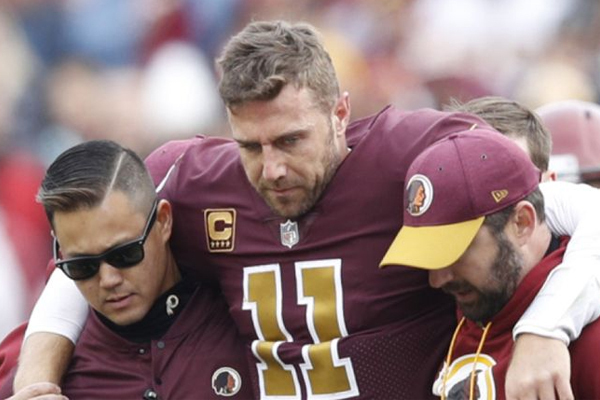 During Sunday’s loss to the Houston Texans, the Washington Redskins quarterback Alex Smith broke his tibia and fibula and will immediately undergo surgery. In the third quarter Smith was sacked by Kareem Jackson and had to be carted off the field. When he went down his teammates knew that his season was over. They saw his ankle bent at an awkward angle. Once he was loaded in the cart they all walked over to wish him well. Colt McCoy, his backup quarterback, was then put in to replace him. Smith is in his first season with the Redskins. He’s completed 64.1 percent of his pass attempts for 2,045 yards, 10 touchdowns, and three interceptions. It’s uncertain how long Smith’s recovery will take or how it will impact his game.